I read a ghastly and withal sobering story in the New York Times. 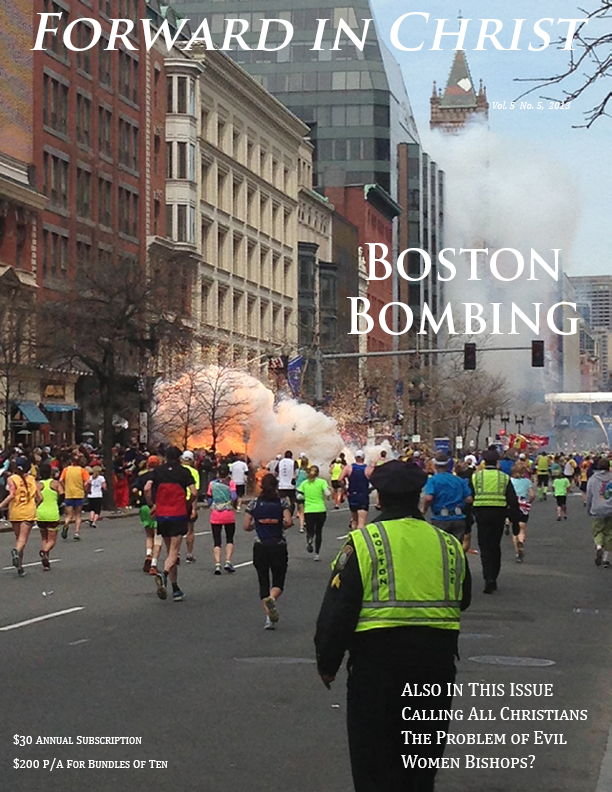 It had to do with the local authorities’ refusal to admit priests – priests, I emphasize – to the circle of rescuers following the Boston bombings. The story mentioned the number of churches close to the bombing site, and the immediate rush of priests to the scene. This is one of the things priests do, am I right? – rush to disasters of one kind or another, bearing spiritual balm: prayers, absolution, the sheer presence of Almighty God if you will amid the tribulation. Yet on this occasion – according to the Times – such priests as arrived on the scene were refused admission. They could take their spiritual services elsewhere so far as the secular authorities were concerned, and, to be sure, they did: repairing to their churches, ministering to the shocked, offering such food and sustenance as they had at hand or could acquire. And of course praying, if only at a distance. But no priestly functioning at the scene, as scores lay dead or gravely wounded. Among these, the Times story noted, was 8-year-old Martin Rich, a Catholic. He was indisputably dead. (How painful a thing it is to write such words, knowing they apply to an 8-year-old boy.) Whether his body lay there still as the priests, with their unction, reached the perimeter of the disaster, I have no idea. The point was moot; the priests lacked permission to approach. One of them (according to the Times) spoke understandingly of the authorities’ position. How were they to know that some terrorist or other had not grabbed a clerical collar so as to seek admission to the circle of destruction, there to take more lives? One can understand the point while not understanding it at all. In any case, a far larger point is at hand. It has to do with the increasing marginalization of the spiritual in what is perhaps the only Western country where the spiritual has much more than a foothold. A priest come to administer the last rites to the maimed or the dying (not knowing how many there would be) -- does such a figure, once familiar to us, now excite indifference or suspicion more than it produces gratitude? That could be one interpretation of the point. It is a disturbing interpretation for what it says about incipient secularism even among the rescue professions. But there is an oddity – an incongruence – to it that strikes one just as forcefully. The word “evil” gets tossed around in the context of mass slaughters – Newton, Conn., Boston, etc. – but this may be a conditioned reflex more than anything else; the consequence of the search for ways to express the fullness of our horror. As Christians understand, nonetheless, evil is more than an ambiguous force in our affairs. Evil is the distinguishing property of the one called, variously, the Adversary, Satan, the Devil. The Christian priest, if his formation has been sound and his experience deep enough, understands this reality in a way no police chief or National Guard captain, howsoever well-meaning, can understand it. On the theory that evil both exists and exerts itself in the world, the Tsarnaev brothers (known for legal reasons as the “alleged” bombers) were actors in a drama scripted and overseen by the Father of Evil. This business was the work of the Devil. I do not speak loosely. I mean every syllable. The Devil engineered the occasion: saw to the planning, the execution, the consequences. The wise priests who rushed to the massacre scene in Boston had some real sense, I imagine, of what the Devil had wrought and what had to be done about it in immediate, human terms, there at hell’s very gates. The authorities’ rejection of spiritual aid and counsel ups the stakes in the spiritual warfare now raging around the world – warfare in which neither man-made explosives nor pilotless drones will prove decisive. What will? Prayer, repentance, fasting. Not least, recognition of the true enemy’s terrifying face.